Employers in the United States have a problem. The skills gap, the space between what job seekers know and what employers need them to know, is widening, especially for middle-skills workers. Educational institutions offer degrees, but no guarantee that those credentials will lead to actual jobs for their graduates. Staffing agencies and workforce boards are operating in their individual silos, often relying on outdated philosophies. The situation is unsustainable. Fortunately, some flexible, innovative educators and employers are finding ways to revamp the system to create better outcomes for everyone. Employers look at the skills ecosystem today and what they see is a confusing mess. Each state and often each region has its own philosophy around training and educating workers. As a result, employers are left with a workforce that has inconsistent skills and no real way to judge who is qualified. In short, while many institutions are bestowing credentials, it’s next to impossible for employers to understand what those credentials actually mean in practice. Meanwhile, workers know they need to upskill, but they too are faced with a myriad of options that don’t quite line up with their needs. They want to improve their skills, in fact, they know that improving their skills is imperative, but they don’t have the time or means to quit their jobs, take out thousands in debt, or stop taking care of their family to earn a degree. Finally, workforce boards,staffing firms and institutions of higher ed, all of whom play vital roles in the workforce ecosystem, are speaking different languages, and sometimes working at cross-purposes as they attempt to meet the changing needs of the workforce. Add to this that the rate of change is accelerating everyday as new ideas and new technology hit the market. It’s no wonder that the skills ecosystem is a mess. The system of upskilling and training workers that employers, workers, and stakeholders have inherited is one that was designed for a simpler time. A time when local workers met the needs of local employers, and highly technical skills were in low demand. To meet modern workforce challenges, we need a modern approach, one that is both sustainable and scalable. Creating a solution starts with an understanding of the factors that are causing in the problem. First, while the unemployment rate is at a record low, underemployment is between eight and 15 percent across various regions of the country. That’s why workers in general want to improve their income and career mobility. At the same time, middle skills professionals don’t want to go into debt. They’re looking for upskilling that meets the same criteria as any other consumer purchase: quality, affordability, and convenience. Solutions that meet those criteria are in short supply, for now. Although a lot of capable, well-meaning providers are working on the problem of upskilling workers, each one is essentially working independently. Employers, institutions of higher ed, workforce boards, and workers sometimes feel like they’re not even speaking the same language. Even though everyone wants the same result - qualified workers with good job prospects - they’re not united in their attempt to achieve it. A sustainable, scalable solution starts with coordination across these isolated systems. So providers like Penn Foster, who want to be part of the solution, are essentially building a bridge between working learners and employers. By bridging the gap, Penn Foster has found opportunities to unlock additional value for both parties. Toward that end, they are partnering with EmployBridge, the largest specialty staffing company in the United States, as well as with major employers like Banfield Pet Hospital, Penske and others. “We’re going to empower [stakeholders] to play at a bigger level, and ideally put more and more institutions into the upskilling business,” Britt said. Currently the federal government provides funding in the form of Pell Grants, student loans and Title IV funding. While that money is valuable, it may not be accessible for everyone - especially workers who don’t want to carry large student loan debt. The Federal Government, specifically the Department of Labor, will continue to explore policy options based on new research, but their primary role in the future will be to provide incentives. With the right incentives, alternative providers like Penn Foster, can operate on a level playing field with traditional colleges and universities. In the future, institutions of higher education should look to employers, not government agencies to fund the education of working learners. Banfield Animal Hospital, for example, provides subsidies to help workers become veterinary assistants or veterinary technicians. It helps remove an element of risk for workers. Instead of going into debt with the hopes of getting a good job, their good job helps pay for their education. Of course, some employers fear that by upskilling workers they’re preparing their workforce to find better jobs somewhere else. While it’s an understandable fear, it’s one that does more harm than good. Preventing workers from learning and developing holds the business back and discourages ambitious employees. Workers want mobility. In surveys, workers site the opportunity for growth and development both in terms of their role and their pay as a vital concern. When employers create opportunities for mobility within the organization it shows employees that they are valued, and that they don’t have to go elsewhere to find great opportunities. Massive companies like Amazon, Walmart, Disney, and Lowe’s as well as staffing companies like EmployBridge have seen the writing on the wall. They’re investing in solutions to upskill existing employees and quickly train new ones. 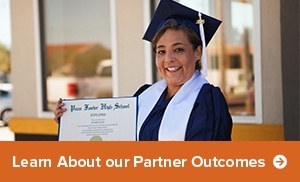 The result is a positive return on investment with a byproduct of a positive social outcome. In short, the future of work for middle-skills employees must include plenty of opportunities to improve their skills without putting their livelihoods at risk. By working together, employers, institutions and staffing agencies can create sustainable solutions that work at scale. 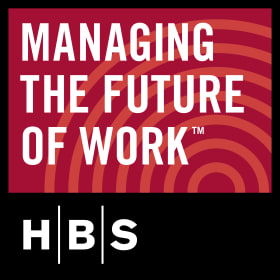 For more from Frank Britt on the Future of Work, listen to the Managing the Future of Work Podcast with Joe Fuller.